Daisy is such a victim with a broken spirit and lifeless eyes that reflect nothing but blank stares. 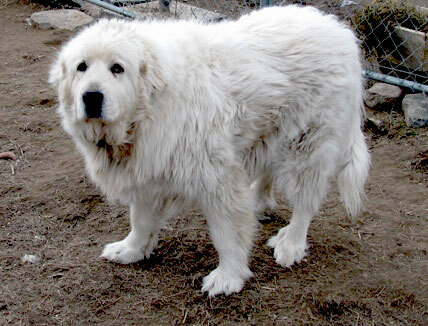 A backyard breeder/hoarder kept her on a chain next to a chained male Pyrenees strictly to produce litters for profit. Malnourished and exposed to the contrasting freezing and hot temperatures of eastern Washington was her existence for years. The Adams County Sheriff’s Department raided the breeder’s location. What they found was appalling. One dog had strangled itself on its collar, four adult dog carcasses were found and one hundred eleven Australian Shepherds were seized. Many were in pens that measured 3 by 4 feet by 4 feet high, filled with a foot of dog feces and no food or water. Daisy was taken to a veterinarian and found to have round worms, whip worms, tape worms, and sucking lice and also suffered from acute Pyometra that required emergency surgery to save her life. Daisy then received foster care and Precious Life Animal Sanctuary was contacted. We took ownership and are making her last years as comfortable as possible. Daisy is content to sleep almost all day and night inside our home which is rare for her breed. She has no desire to bark or roam. She has a deep-rooted fear of being taken outside and not being let in the house again. When the door opens to let her in, she enters at a gallop with as much an expression of emotion as she can muster. She quickly lies down and sleeps until she is either fed or forced to go out again to do her business. It will take years if she lives long enough to somehow grasp this is not another step along the way. She is home to stay and to be loved and cared for the rest of her life.